Polished silver pulls and knobs offer a stark but beautiful contrast to the dark cherry finish of this traditional style chest of drawers. 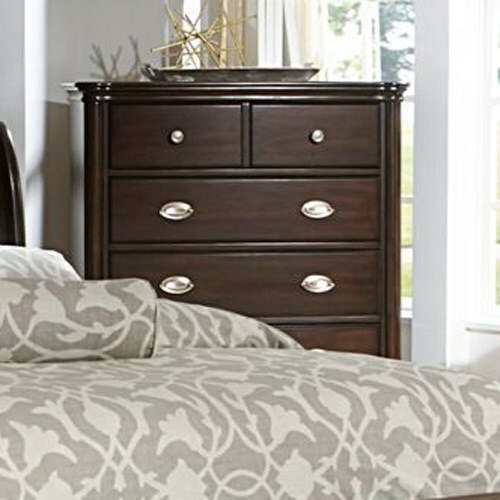 The bedroom storage piece shows off a timeless look from its elegantly turned feet to the gorgeous molding. Four spacious drawers and two smaller ones offer ample storage to help you stay organized. The Marston Traditional Chest of Drawers with 6-Drawers by Homelegance at A1 Furniture & Mattress in the Madison, WI area. Product availability may vary. Contact us for the most current availability on this product. Traditional style and a beautiful dark cherry finish define the Marston collection. Neutral tone fabric and oval bale hardware offer a gorgeous contrast throughout the collection to give it a one of a kind look. The Marston collection is a great option if you are looking for Traditional furniture in the Madison, WI area. Browse other items in the Marston collection from A1 Furniture & Mattress in the Madison, WI area.